Use as a super snack, dry mill and add to cereals orblend into health drinks! 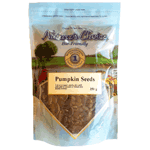 Pumpkin seeds (pepita) are edible kernels of fruit pumpkin. The seeds, in-fact, are concentrated sources of many health-benefiting vitamins, minerals, anti-oxidants, and all important essential amino acids like tryptophan and glutamate. Import of South Africa.